The following article illustrates how to use the mind map shapes. By adding topics, subtopics and relationships to create a basic mind map diagram. 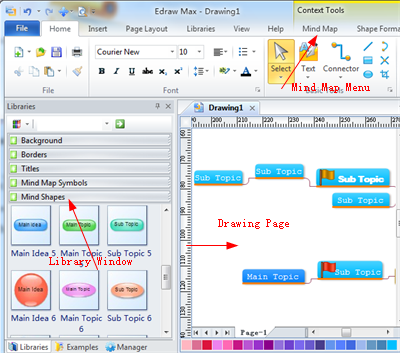 When the Mind Map is started, you will be confronted with the typical Edraw environment; library window to the Left, and the drawing page filling the remainder of the Edraw environment. Additionally, in the ribbon menu you will see a new Mind Map menu. There are five types of main shapes in the Mind Shapes library. Main Idea - The main idea or title of your mind map or brainstorming diagram. Main Topic - The major topics or issues that make up the idea or title. Sub Topic - Details or steps about a topic. Relationship - Illustrates a special relationship between two topics or subtopics in your mind map using an Association line, which appears as a dashed line between associated topics. Callout - Additional information for a specific topic or relationship. Every type of Mind Shape includes some different style shapes. Learn more about mind mapping shapes here. To begin, drag a Main Idea symbol out onto the drawing page. You can type the text on the face of this mind map symbol to something that makes sense for your business. One page has only one main idea. 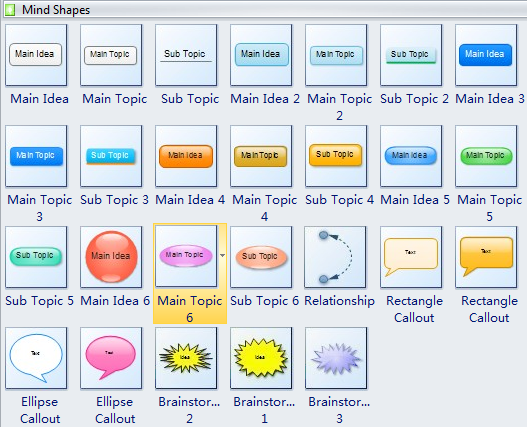 From the Mind Shapes library, drag the Main topic shape onto the drawing page. The smart guide will show as the following image. Release the mouse, Edraw will create the connector automatically according the setting. Double click to type the text that you want the main topic to represent. To add a subtopic, drag the Subtopic shape to the page. With the subtopic shape selected, type the name of the subtopic. If a topic is selected, the Insert Topic tool will add a same-level topic. If a subtopic is selected, the Insert Topic tool will add a same-level subtopic. If no topic iss selected, the Insert Topic tool will add a main topic. If a topic is selected, the Insert Subtopic tool will add a sub topic of the selected topic. If there is not any subtopic selected, the Insert Subtopic tool will add a new main topic. The Insert Relationship tool illustrates a special relationship between two topics or subtopics in your mind map using an Association line, which appears as a dashed line between associated topics. On the Mind Map menu, click Insert Relationship. The cursor changes to the relationship cursor. Move the cursor near to a topic. The connection points will show above a shape. Point the cursor at any connection point of the topic. The connection point will be highlighted red. To glue an endpoint of the connector to a connection point on a topic, drag the endpoint to one of the shape's connection points until a red box appears around the connection point. Topics do automatically connect when you drag them from the Mind Shapes library. so you only need to understand how to change the connection style in Edraw. You can set the style of your connectors to Straight Line, Arc, Curved, Elbow or Rounded-Angle Line; each conveys a different tone. A straight connector is best to show a rigid, structured, technical, or formal diagram. An Embed connector is best to show an organization. A curved, arc or rounded-angle Line connection works best for a diagram that is informal or non-technical. The Arrangement Direction affects the layout mode of the topics and subtopics. To change the arrangement direction, you need to select a topic or subtopic. Then click the Arrangement Direction button. In the menu, there are eight types of arrangement directions.